I was absolutely thrilled last night when Helen gave me my birthday present, she has secretly designed and made a cross-stitch sampler all about me! She has stitched me in a nurses uniform, my interests are represented with a sewing machine and dressmakers dummy, a watering can for gardening, the WI symbol, the Yorkshire rose and butterflies for my love of nature. Our two dogs and two of the chickens are pictured, Helen has also included the names of all our children (two each! ), our wedding date and my birthday. It’s a wonderful record of this moment in time, it’s brilliant! She borrowed my Jo Verso ‘Picture it in Cross-stitch book to help her design it, had a few secret discussions with my OH and a panic last weekend apparently when she realised it was only a week away…she took it to Artworks to get it framed on Friday and pleaded with them to have it ready for Saturday!! I love it! This is the third sampler she has done, the first one was when she was 8 years old, she’s a bit embarrassed by it now (being a cool 17 year old!) due to wonky lettering etc, but I think that’s all part of family treasures. When my OH reached his 50th birthday, she wanted to make him a sampler, so I helped her design one that included the main places he has lived, he was overwhelmed when he received it and he treasures it dearly. I am so pleased with my sampler, I shall have to find a special place to display it. 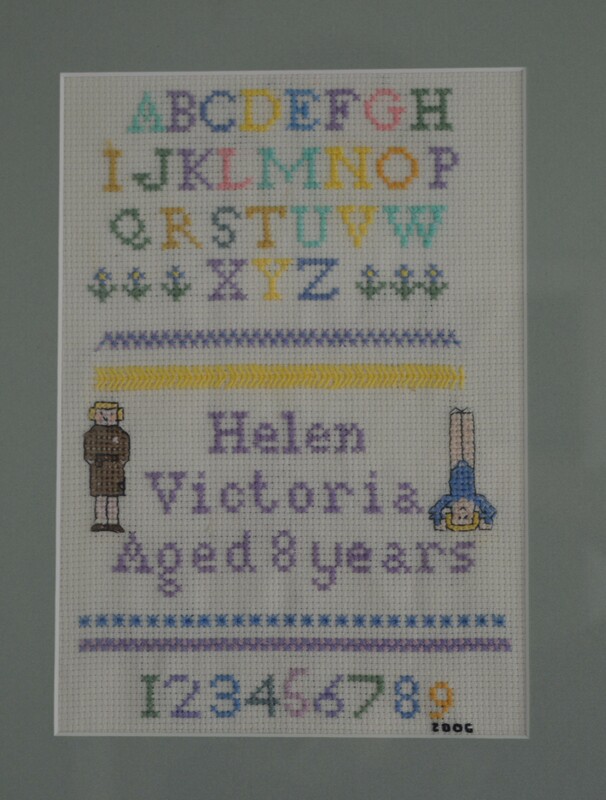 This entry was posted in Crafts, Serendipity and tagged Birthday, cross-stitch, sampler. Bookmark the permalink. What a lovely gift. Very nice! That is so sweet! What a wonderful way to show her love. Just beautiful!! What a very special gift! There is a lot of love in this sampler! Yes, how very special and what a treasure! I’m sure you are going to enjoy it for a very long time! What a thoughtful gift, full of love! Happy Birthday.What a lovely and thoughtful gift. What an awesome gift. Who wouldn’t be jealous! Thoughtful and beautifully created gift! This is beautiful 🙂 What a thoughtful gift! So much thought and time went into designing this. She did a wonderful job! Thanks so much for linking up to last week’s Stitchery Link Party and for linking back. Aloha hugs!